In addition to the new photos here, there are also 2 new sections- "Four Horseman /Colorforms comparisons" and "Fan made items". There are lots of cool photos in all 3 sections. 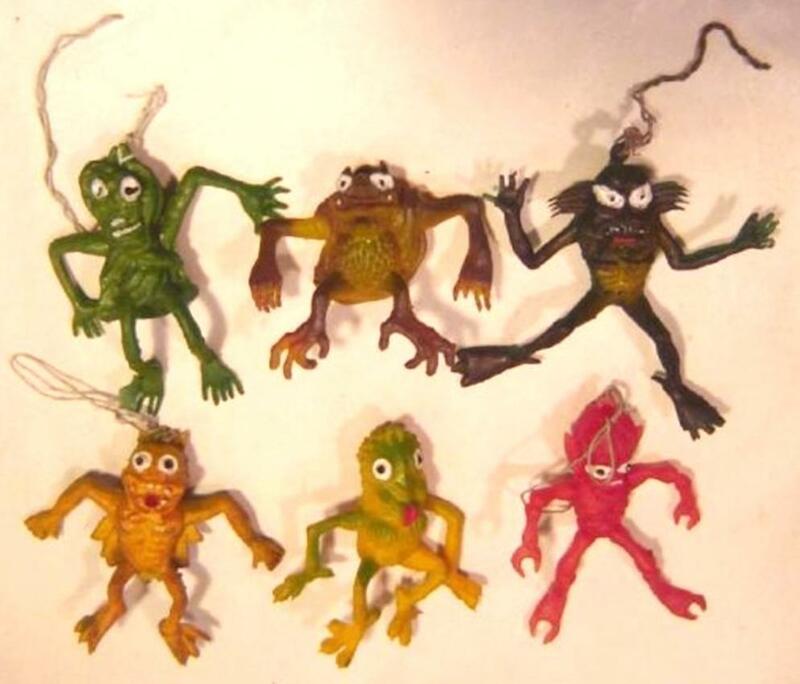 Some more of the extremely rare suction cup aliens recently turned up on ebay. 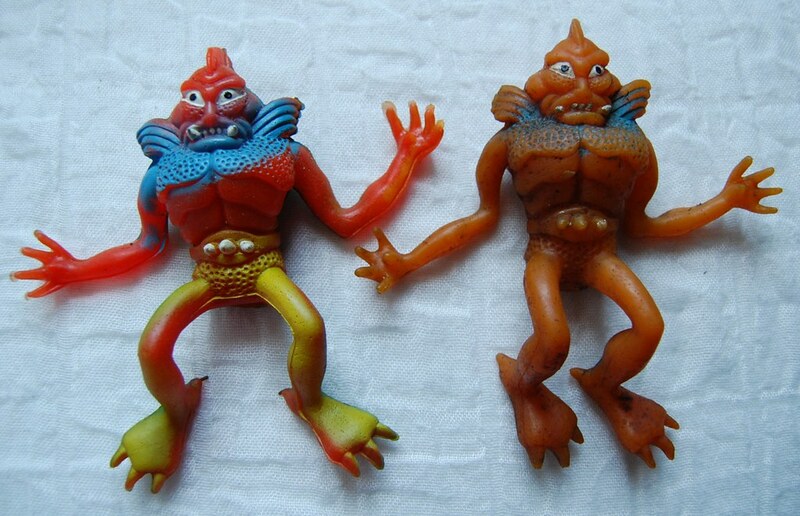 Previously unseen by mainstream collectors are Xodiac and Astro-Nautilus (plus 3 Electrons) were in the lot. 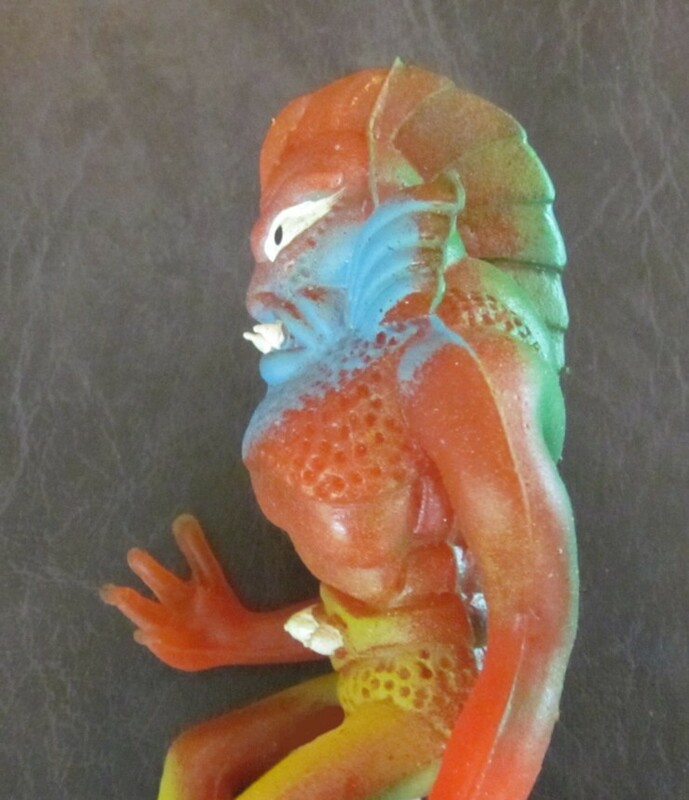 I was lucky enough to get the handless Electron when he resurfaced on ebay a week or so later. 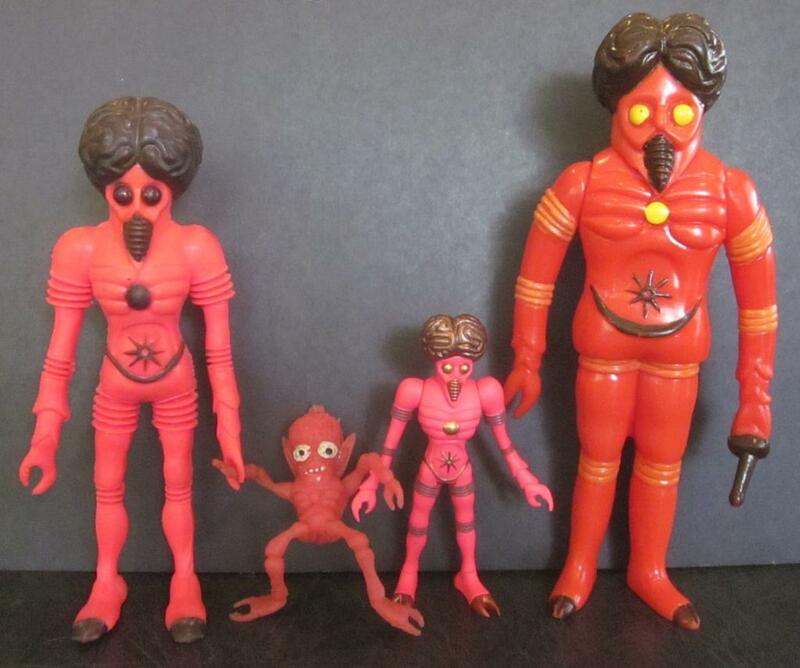 Here are 4 different versions of Orbitron. 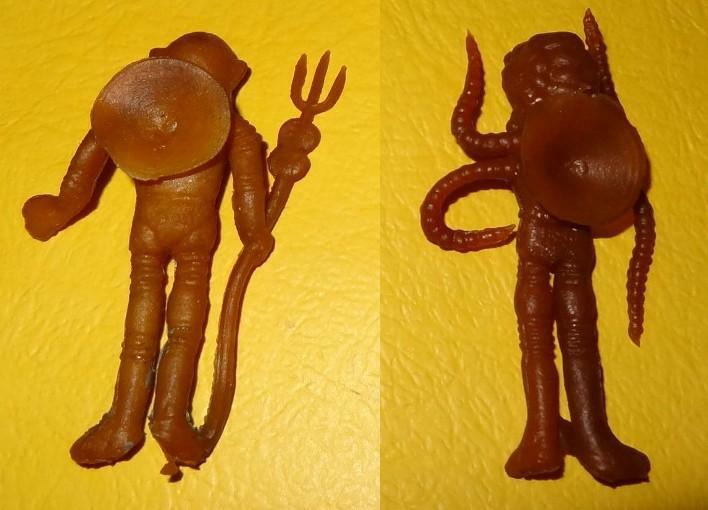 You can clearly see that the pink jiggler is supposed to be Orbitron by the shape of his chest and his claws. This jiggler is fairly common but very rare in pink (I was lucky enough to recently acquire one). 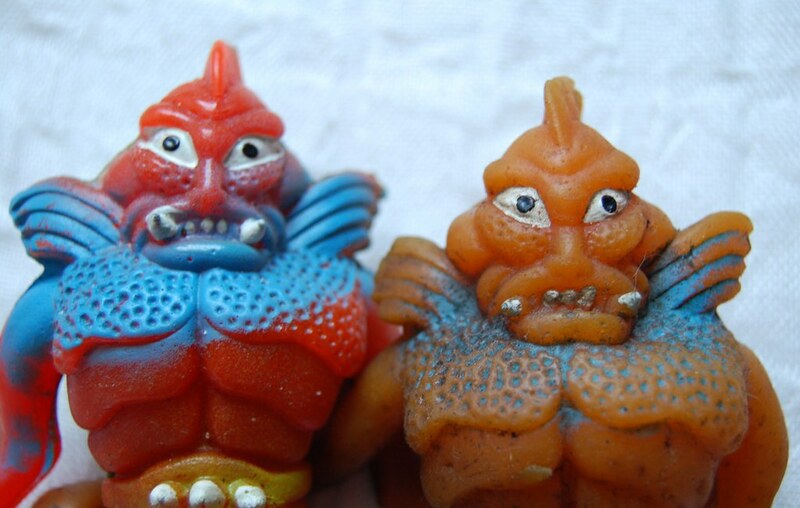 Here are some pics of the 6 inch red Colossus Rex jiggler with another extremely rare jiggler from the same toy line that I recently picked up. 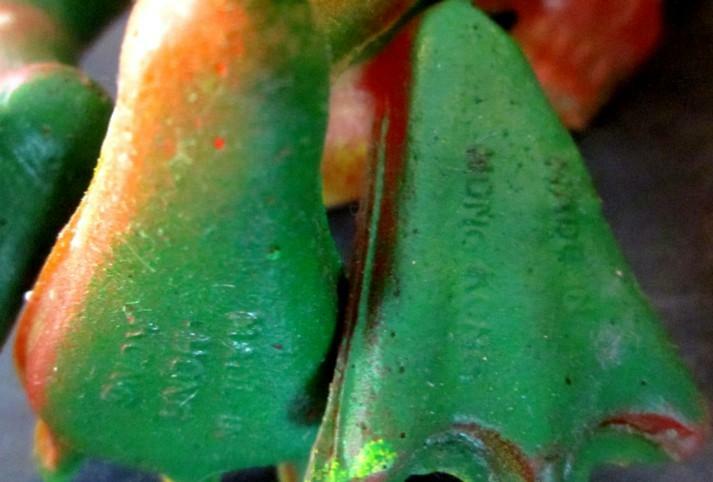 Notice that the manufacturing marks on the bottom of their feet are essentially identical. After weeks of negotiations, I have managed to trade for this jiggler from my friend in Italy. I had to give up my old orange version to get him, which was very much worth it! 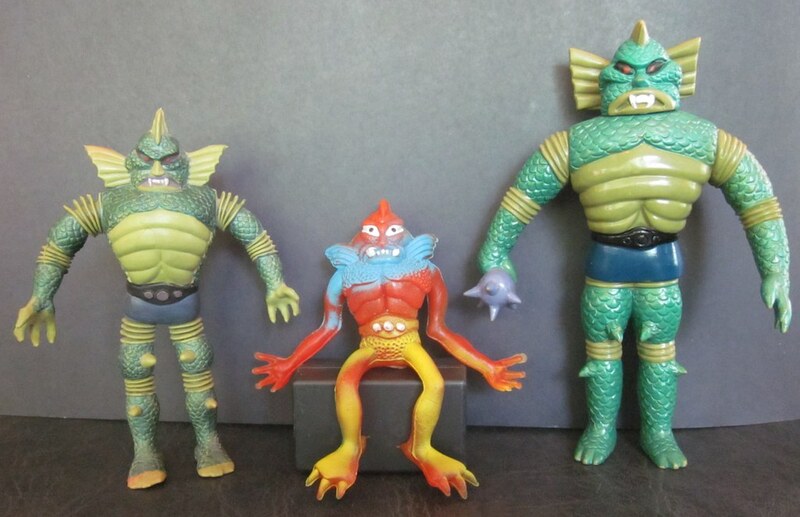 The next two pics are of the 3 largest versions of Colossus Rex. 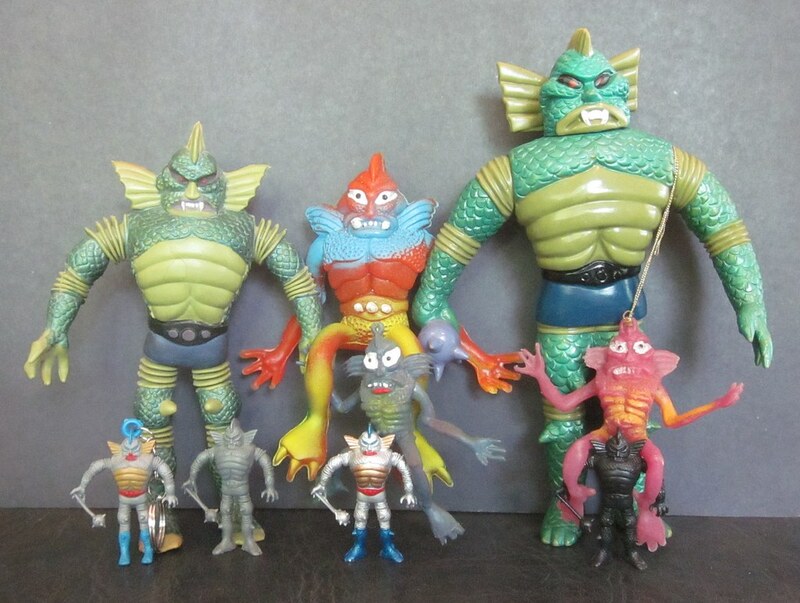 Here is a photo of 9 different types of Colossus Rex figures. 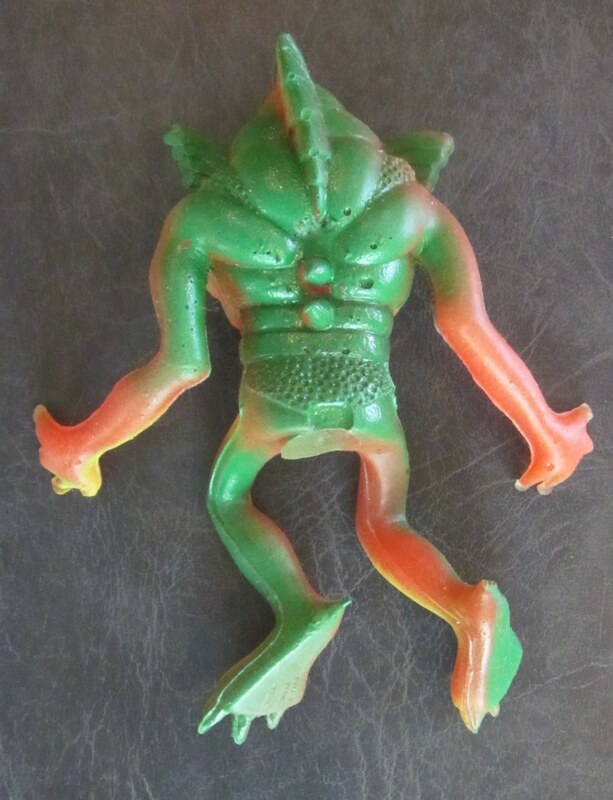 All that is missing is the orange version of the 6 inch jiggler and the small figure I saw in a bubble gum machine in the '70s. 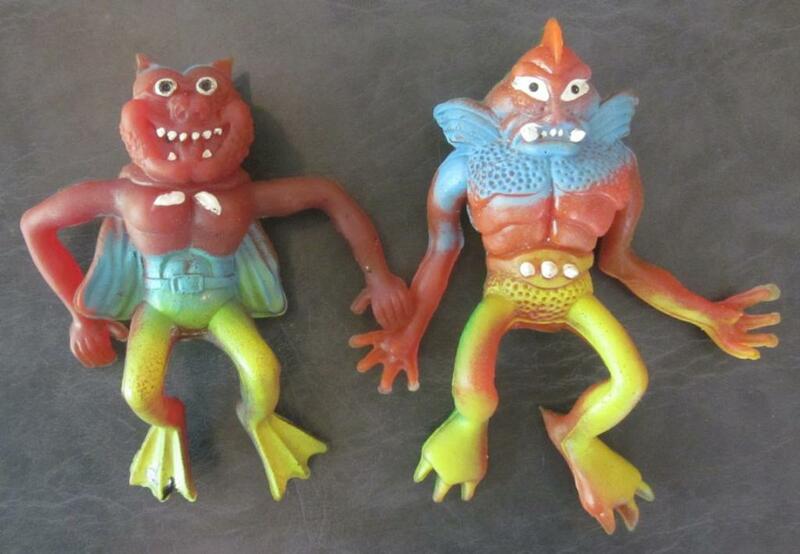 My friend in Italy was nice enough to photograph these cool jigglers side by side before sending the one on to me. I am very grateful for that. 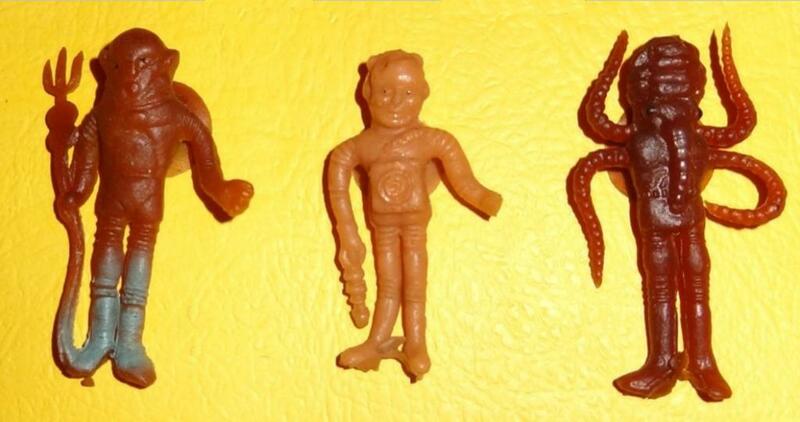 These toys are very rare, it's great to have a photo of them togther. 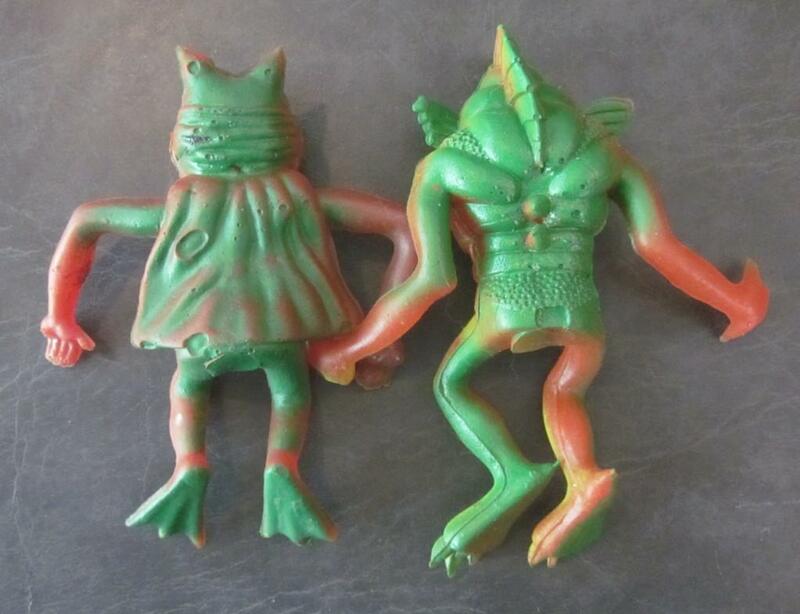 And this photo proves that these 2 jigglers are from a separate toy line, if not a completely different manufacturer using the same molds. 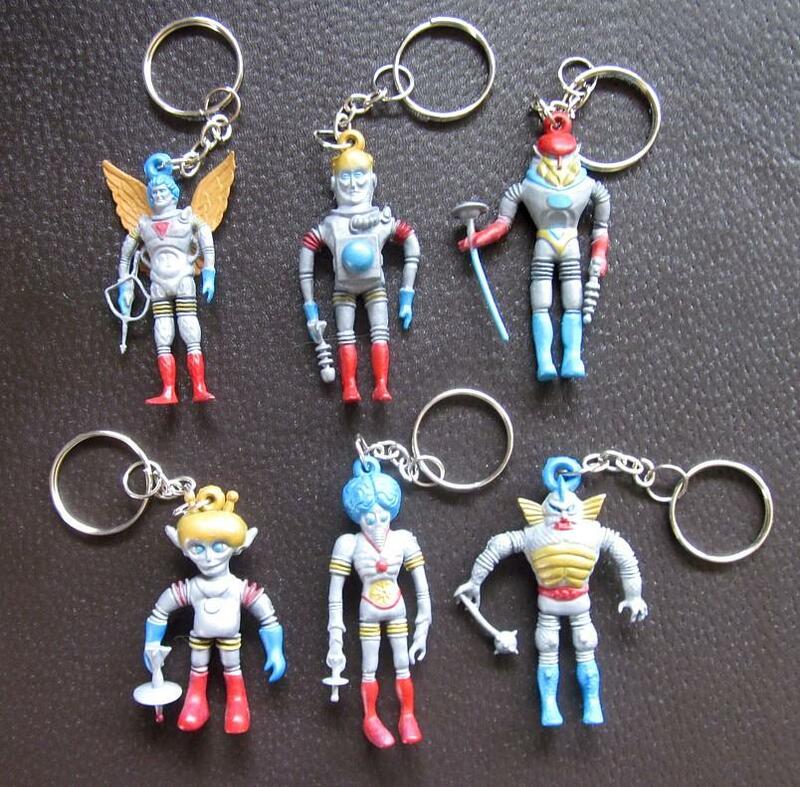 The Outer Space Men Key Rings are an item that has only surfaced recently. 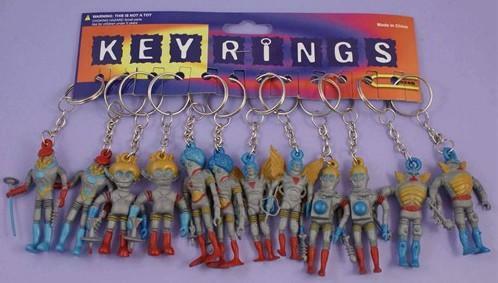 They were for sale by a company called Jewelrry-world in the UK but they recently sold completely out. It is not known if they were commercially available prior to 2012 as no one seems to have even known they existed (there are very few people in the UK that even know what the OSM are). These figures are about 6% shorter and 9% thinner than the much more common miniature silver figures (making them the smallest OSM figures ever made). 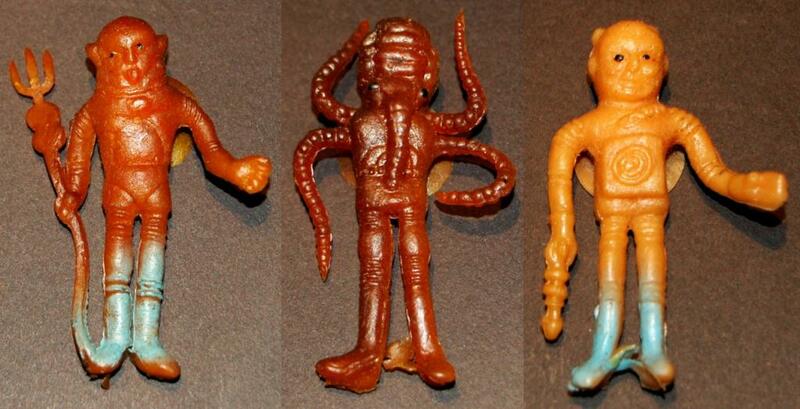 They are also made of a rubbery plastic 2 to 3 times more flexible than the silver aliens. 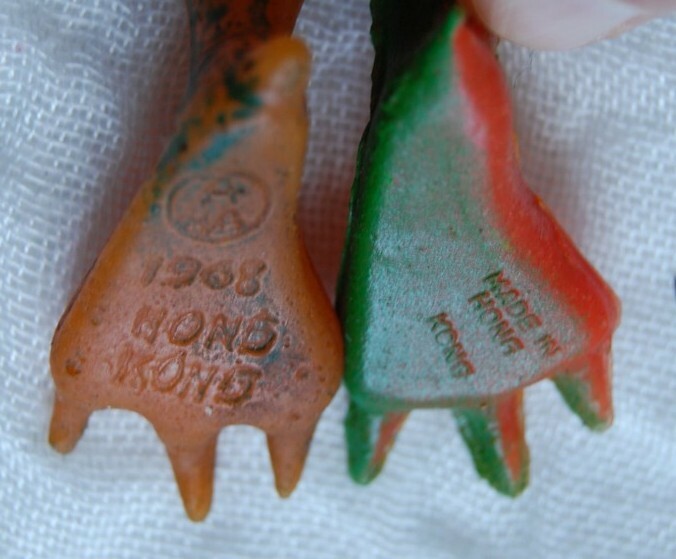 They are grey plastic with red, blue and yellow paint. And here we have a close up of a nice complete set. 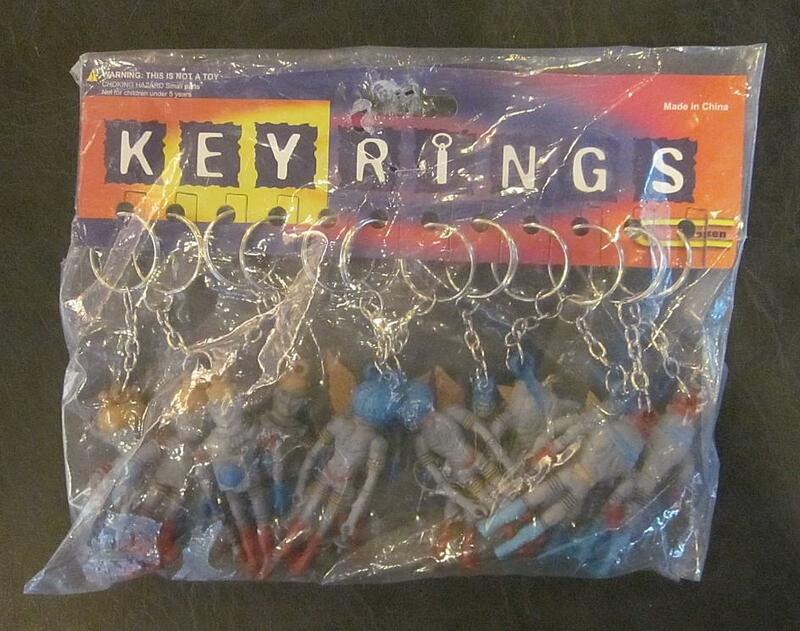 This is the only known sealed bag of these key chains known to exist. They came in bunches of 12 (2 of each). 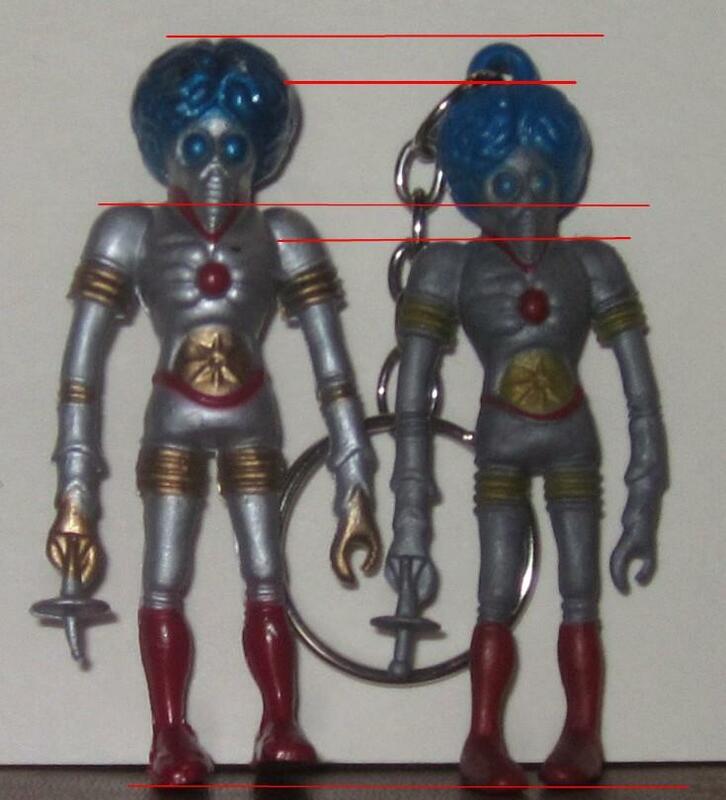 Side by side comparison of the mini silver Orbitron and the key ring Orbitron. By the best of my ability to measure, the large one is about 6.5% taller. 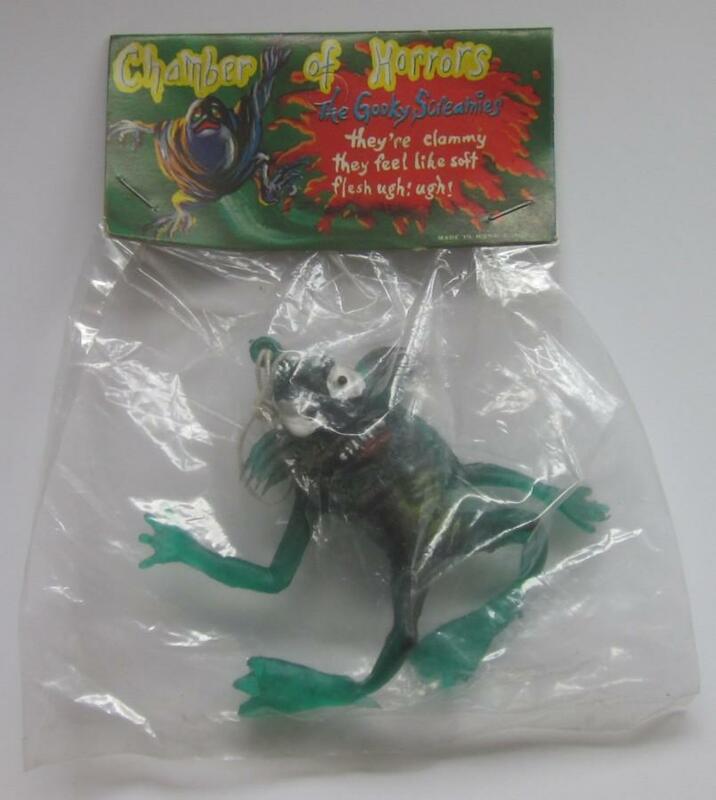 Below we have the 4" jiggler version of Colossus Rex in his original packaging. This is probably just one of the ways this was made available to the public. 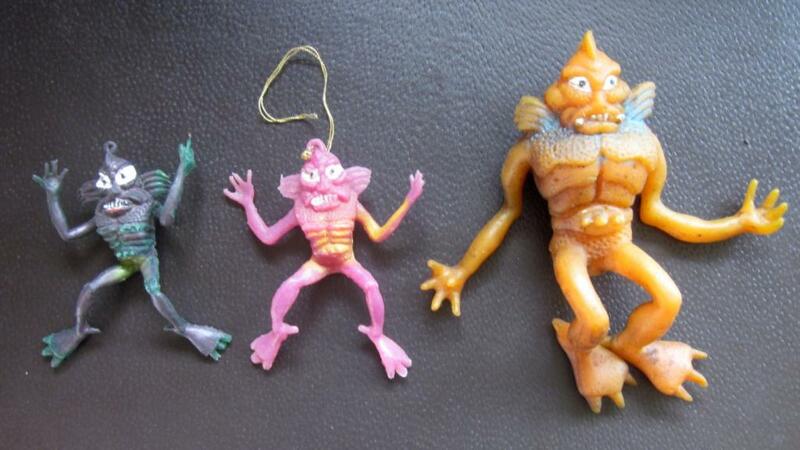 This photo is an old Ebay auction which included a 4" Colossus Rex as well as a pink Orbitron knock off. 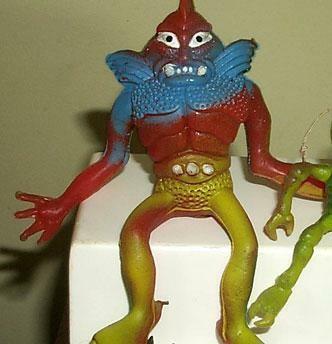 The Orbitron doesn't much resemble the Colorforms alien but the pinchers and shape of it's chest makes it obvious that it was modelled roughly based on Orbitron. 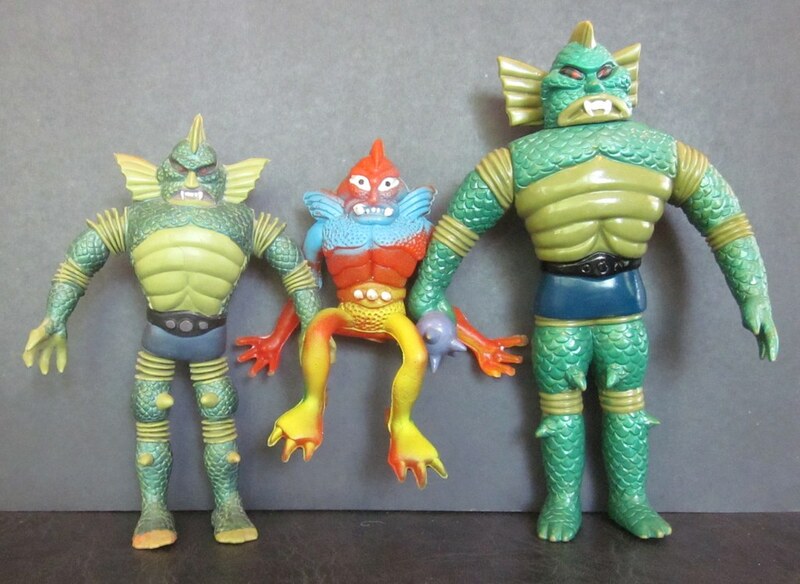 This figure seems to be a lot more common than the Colossus Rex jiggler but it is usually in yellow. This is the only pink one I have ever seen. 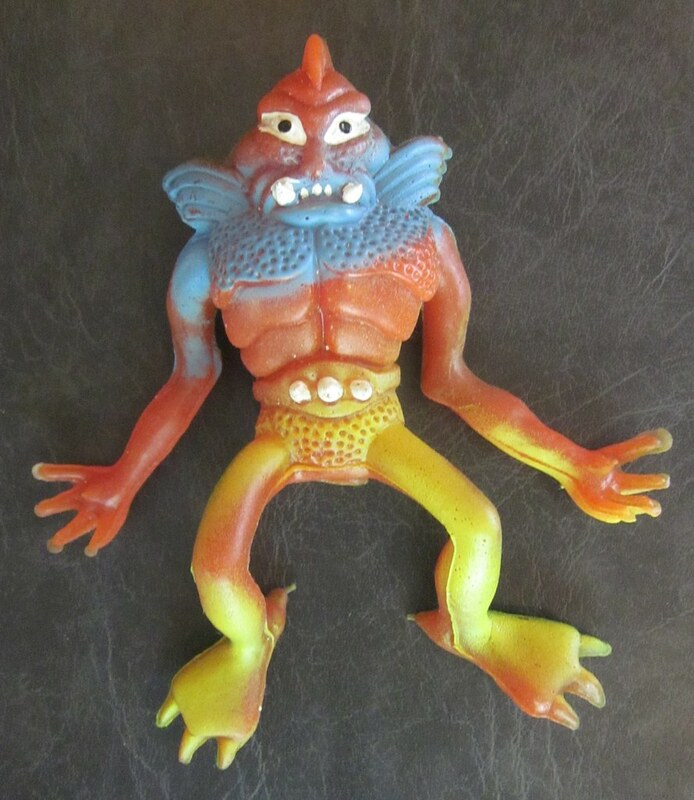 This version of the 6 inch jiggler was on Ebay many years ago as a part of a lot and went for more than I was willing to pay. I've regretted it ever since. 2 different sizes and 3 different Colors for Colossus Rex jigglers.